Starting in April, consumers and fleet operators will be able to order 2013 Chevrolet Silverado and GMC Sierra 2500 HD extended cab pickup trucks that run as bifuel trucks on compressed natural gas and regular gasoline but price info is not yet available. The two pickups will be powered by a compressed natural gas (CNG) capable Vortec 6.0L V8 engine that seamlessly transitions between CNG and gasoline fuel systems. Unlike a Nissan Leaf, there is no range anxiety because the trucks have a combined range of more than 650 miles. The Silverado and Sierra will be available in standard and long box, with either two- or four-wheel drive. Yet, it's not just distance that is going to make these two pickup trucks appealing. There's also the issue of cost. A gallon of CNG can run about 30 percent less than traditional regular gas. At $4 a gallon for regular, you're saving about $1.20 a gallon each time you fill up. 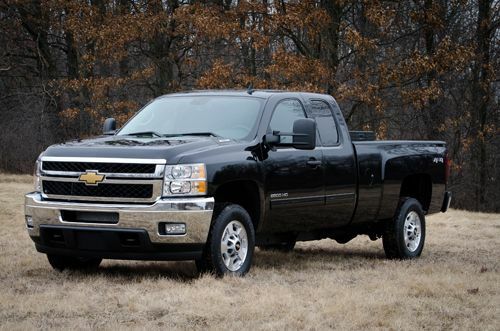 The price of the Chevrolet Silverado and GMC Sierra with the CNG bifuel option is not known yet. Expect pricing to be below the Silverado Hybrid that starts at $39,640. GM did not release expected fuel economy numbers for the two trucks, which currently have EPA ratings of 15-mpg city and 22-mpg highway. Using the Honda Civic model equipped with a CNG engine as a guide, you can probably expect 14-mpg city and 21-mpg highway with the pickups. GM is the only manufacturer to offer a single-source option for its gaseous fuel vehicles. The bi-fuel trucks are built with a specially designed engine, the fuel system is installed by GM’s Tier One supplier and the completed vehicle is delivered directly to the customer. The bi-fuel commercial trucks will be covered by GM’s three-year, 36,000-mile new vehicle limited warranty and five-year, 100,000-mile limited powertrain warranty and vehicle emissions warranty, meeting all Environmental Protection Agency (EPA) and California Air Resources Board (CARB) emission certification requirements. It is the most extensive warranty offered by any manufacturer on commercial products. CNG vehicles have become a viable alternative as the infrastructure has grown to support them. CNG refueling stations have become more prevalent, especially with the focus on CNG for use by taxi fleets. GMC and Chevrolet have not discussed price information for the new bi-fuel trucks that will be delivered late in 2012. More information is available at gmfleet.com on ordering the GMC Sierra and Chevrolet Silverado. Since they're offering this engine in their 350-class vans, it makes sense they'd (finally) do this in trucks as well.